Will Trump Bring America Back To God? – I Am Not Ashamed Of The Gospel Of Christ! Home › Advocacy › Will Trump Bring America Back To God? Will Trump Bring America Back To God? Why did Middle America vote for Trump? Why did the Bible Belt vote Trump? I think it’s safe to say that many Christians voted for him because he was the lesser of 2 evils. Many Christians voted for him because they likened him to a modern day cyrus. Which I didn’t agree with. Yes God uses the wicked and the righteous for his will to be accomplished. But Cyrus, no. God transformed Saul into a great Apostle and man of God, so as He told Job, He blesses and curses whom He chooses. As I watch the darkness and wickedness unfold, it’s clear Americans made the right choice, or God made the right choice. But why Trump? Why not Ted Cruz or Marco Rubio. Both are more of a devout example of Christianity. Trump never claimed to be devout Christian or conservative. In fact he said he saw no need for repentance in his life. He has said straight from the start he is a business man and will run the country from thst aspect. He has good ideas to protect, build up our infrastructure and give jobs back to Americans. He said he’s pro-life. We will see. He said he will give us real, not fake affordable health care. We will see. He says he is a friend of Israel, we will see. When Obama was elected the first time those of us awake knew what was coming. But we set out to watch, and it didn’t take long, in fact the first thing he did in the world told us where his allegiances were. Remember Cairo? He said America was not a Christian Nation. Then it went down hill, one failed foreign policy after the next, one failed domestic policy after another. Everytime his pen hit a stroke America fell a notch. He, headed by Valerie Jarrett and Clinton and John Kerry led us to negotiate a deal with a terrorist. Iran. Jarrett and Kerry both have ties through family to Iran. If I have to lay out why this was a disaster, I suggest you research, and open your eyes. He sat silent while Christians were slaughtered, joined by other minorities such as Yazidi’s. He sat silent while one of the most demonic religious wars grew across 1/2 of the globe. So will we see a changed, more peaceful world with America at the helm again? We will see. Our job has only begun. Is the weak church in America up to this new challenge? If they follow the path they did as Obama wreaked havoc, NO. It is my opinion God used Obama to lay the way for Americans to wake up. He used Trump in the same manner. He is calling His people to order, will they pass muster or will they be thrown out with the tares? I agree with most, this is our last chance to heal our land, it’s our last chance to redeem our land. But will we turn back? We are headed straight into the middle of the great tribulation. And so many are distracted. We have been given a short reprieve? Or has God’s church here been called to repentance in order to help the sufferring and persecuted? We have to find our salt, ready our lamps, or we will be caught unaware. Satan has been unleashed and he knows his time is short. Be ready, for our salvation is nearer now than when we first believed. 9 You shall break them with a rod of iron. Christian Organizations In America Accepting Blood Money? THIS is to address the issue of President Elect Trump…The Lord chooses whom He will to accomplish that which is His will! We can question all we want (which can be a platform for open discussion and sharing of the Gospel) but God is in control. Question is will the Church” be alert and heed the time we have been given. The Precious Lord is telling His Church to clean house and get your affairs in order for my Son, Jesus Christ is coming! Prophecy is being fulfilled before our very eyes…..Just as God dealt with the Israeli children when they turned from their True God; God Almighty disciplines his children because He wants us to return to Him. Repentance is turning away from our sins and asking for forgiveness in the name of Jesus. We strive the push into Jesus and God’s Word seeking to His will and share the Gospel to bring others into the Kingdom of God. The bible tells us how everything will play out….we are not to put our hope and trust in President Elect Trump but in Jesus Christ alone period. President Elect Trump is here to serve the people of America and we need to be alert and hold him to his word on his contract with the people of America. America has sent missionaries to many countries over time and the Precious Lord has used America to spread the Gospel. DON”T be caught like a deer with its eyes caught in preverbial head lights America. President Elect Trump is a man! He is not God. President Elect Trump is a person whom has taken on a task of great importance and it would be wise to pray for Godly people to surround him for wise counsel. President Elect Trump is guarded believe it or not and YES their are witnesses watching of he Lord to SEE and RECORD exactly how the Church will behave and react to this transition and the time given us. We are not given to be in arrogance and pride because we voted the man of our chose. Seek the Lord in all matters and He will reveal what we are to do the serve Him and Glorify Him. I could say much more but the is not now. Be alert, Seek the Lord, serve the Lord and keep President Elect Trump and his family in prayer for protection and safety and the Pence family. Now here what should answer some of the comments I have read to Sister CJ. The Lord will reveal the revelation of His Word to you. Yes God is love; but He is also a God is righteousness, justice and honor….just a parent disciplines a child who did wrong or went off the path so it is with God…no lesson is pleasant at the time but as time passes it is revealed to the child why he or she had to be disciplined. There is no other God and to try and debate this with me and anyone who is faithful and believes with “all” their heart in Jesus Christ is the Son of God and His Holy Spirit is within us; that person is banging their head on a stone wall. The foundation I stand on and any believer in Jesus Christ is solid, true and the Truth; God’s Word. I do not profess to know or understand everything in the bible or know the mind of God: but I do know in His grace and mercy He called me unto Himself thru His Son, Jesus Christ and saved my from my sins. Do I sin and have to repent? Yes I do and when so; I have to seek the Lord and repent and ask for forgiveness. May God bless and keep you all and be alert and be about the Father’s business. So… what you’re saying is terrible things that happen are God’s will? He’s setting up something better for the future? I’ve been doubting for a while now; can you explain how this is a good and Godly thing so that I can either regain faith or abandon it altogether? Thanks doubting Dan fo reading. I can’t say I disagree with everything you said since I said pretty much the same. However I disagree with the statement that our founding fathers never spike of God. They did. 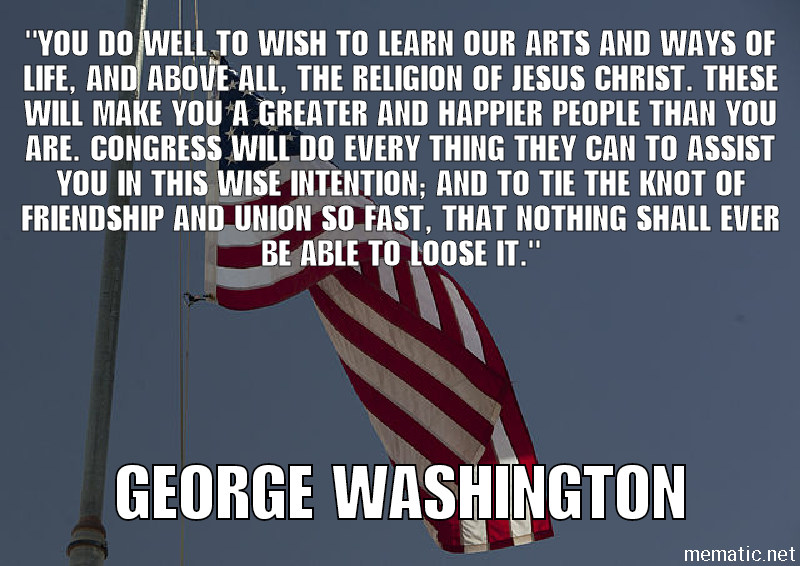 George Washington even prayed and dedicated this nation to God. Yes, we must watch and continue to warn. It won’t be a man that brings this country back to God it will be us and God. I frequently ask questions that require the reader to analyze and pray. Thanks again. One more thing. God punishes and judges yes. But set up bad things to happen, no but he has warned His people. Gid does norhing witgout first revealing it to his prophets. We are witnessing events that are prophesied in God’s word. Simple really, no one knows the Mind of God, but we can know what Christ warned of. I didn’t mention the Founding Fathers. Did you read my comment? Sorry I was answering two at once. Yes I did read your comment. I believe with all my heart in the word of God. I believe in the whole Bible. I believe in the prophets of old and I believe in the Apostles, the warnings given by God in His word. We are witnessing Prophecy being fulfilled. I fought for years against the will of God wishing my will first. God doesn’t cause bad things, man does. God’s will is for all to come to him and none perish, but so many choose not to follow him. The best thing I read about God’s will is the book of job. It’s in Genesis all the way to the end. Nothing happens that God doesn’t know about. Even the darkest parts of my life, when I blamed God, now I see how much he was there with me. He carried me through the darkness, and brought me back to him. I fell to my knees and literally told God, ok I’ve had enough I can’t do this by myself, I will go the roads you lay before me, but you have to lead and go first. Since that day He has never failed me. I haven’t had a really easy road, but He carries me through and always provides. I hope this helps. So, dead babies, disease and being on the receiving end of murder and genocide are because of man? Help me out, here, because I’m having a hard time with an all powerful and loving God who can’t stop these things. Well, it seems a bit silly to me, especially now having had this conversation, to believe that a God who loves us and “could” stop these things at any time simply won’t. I’ll stick with agnosticism; it’s never killed any babies. AND NETHER HAS GOD KILLED ANY BABIES. ONLY MAN. But God gave you free will. And your free to choose. I pray God will dhow you His love and power and guide you to truth. God ordered the killing of babies in the OT. Also, man is not responsible for babies who die during birth, of disease, of SIDS, of dog maulings, in car wrecks, etc. And neither is God. I am not an apologist the word of God speaks for itself. You either choose to believe it or you dobt. If you deny God you will have made a conscious choice where you will spend eternity. I’m sorry but that’s the truth. I won’t reply again. But I will keep you in my prayers. God Bless you. He could stop it at any time just as He did in Noahs time, or when He destroyed Sodom and Gomorrah. But the Bible clearly states in Revelation that given all these things the wicked refuse to repent. In Mathew 24 we see that wickedness increases and hearts grow cold. There is only way one out of this and that is to turn to God, and look to Christ. Doubting Dan, The way I see it is this. God is so holy that no wickedness or evil can be near Him. We have all sinned. There was only one perfect man, and they nailed Him to the cross. Their sentence of death for Him was our victory, because Christ Jesus died for us, for our salvation, so that even though we sin, we are forgiven. Tribulation must come to cleanse the world. Some of us, including myself may be cleansed in the fire, as gold is refined and made pure through fire. Don’t be disheartened. Jesus said as in the days of Noah, so shall it be in days of His coming (Mat 24:37). Yes many who refuse to believe and repent will perish, and there will be many (because of all the dead babies, etc). My heart breaks for them and I pray for their repentance and salvation always. But what did God do for Noah and all who believed what Noah was telling them? He kept Noah and his family safe in the ark while the rest of the world perished. So He will also keep us safe. God gave us a 911! Psalm 91:1 “He who dwells in the shelter of the Most High, will abide in the shadow of the Almighty:” This entire psalm is our promise from Him. Read it, live it, BELIEVE IT! Shalom my friend. I will pray for you. As far as Donald Trump and him bringing God back to the white house…the man is not born again. When asked whether he has repented, he said he didn’t feel the need to repent. Donald Trump to me is the next beast king of Daniel 7. George W. was the first monarch ruler (king) of this nation. He is worshipped in freemasonry along with King Solomon the wise.